"I make these the night before and bake them in the morning. My family and friends can't stay out of them. They are very moist and decadently rich." Warm the milk in a small saucepan until it bubbles, then remove from heat. Mix in the butter; stir until melted. Add water and let cool until lukewarm. In a large bowl, combine the milk mixture, yeast, white sugar, salt, eggs and 2 cups flour; stir well to combine. Stir in the remaining flour, 1/2 cup at a time, beating well after each addition. When the dough has pulled together, turn it out onto a lightly floured surface and knead until smooth and elastic, about 8 minutes. Divide dough into two pieces. Roll each piece into a 12x9 inch rectangle. In a bowl, stir together the cinnamon and brown sugar. Spread each piece with half of the butter, half of the brown sugar and cinnamon mixture. Roll up dough, using a little water to seal the seam. Cut each roll into 12 slices using a very sharp knife or dental floss. Place rolls onto two 9x13 inch greased baking pans. Cover and let rise until almost doubled, about 1 hour. Meanwhile, preheat oven to 375 degrees F (190 degrees C). Bake in preheated oven for 20 to 25 minutes until golden brown. To make frosting; combine confectioner's sugar, cream cheese, butter and vanilla. Add milk gradually until frosting reaches a spreading consistency. Spread over warm (but not hot) cinnamon rolls. 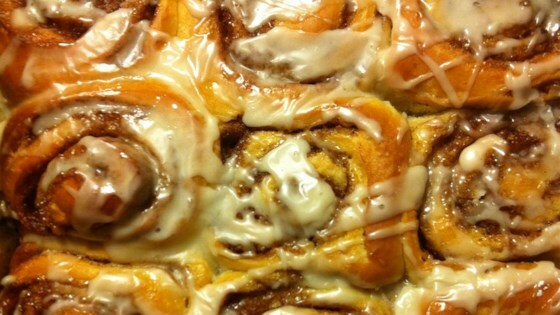 Watch how to make these top-rated cinnamon rolls. To make these ahead of time, follow the recipe up to step 4. Arrange on baking sheets but do not let the rolls rise. Cover rolls with greased plastic wrap and refrigerate overnight. The rolls will rise slowly during the night. The next morning, remove the plastic wrap, set the baking sheets on the counter, and set aside for about 20 minutes while preheating the oven. Bake as directed.